All You Need To Deliver Services To Your Customer! An Online IT Service Desk Software – ITIL provides the IT world with a superb feature that manages all the information, assets of organization and so on in a very methodical manner, known as CMDB (Configuration management database). CMDB is an integral part of ITIL Service Desk Tool. Configuration Items (CIs) can connect to each other freely and a transparency is maintained between them due to CMDB. Details concerning configuration items, their attributes, characteristics and relations with one another is known by utilizing this feature. Insight on CIs (configuration Items) like services provided by the items, availability of CIs, their life span and etc can be known using CMDB. Incorporates with incident, problem and change management modules. Status of assets and a track record of these assets can be kept. Helps in analyzing root cause of change management. Service catalog allows the users to advertise their services in IT World. It acts as a management IT Service Desk tool which allows us to promote services given by organization. It makes sure that the services provided within the catalog are accurate, genuine and available. The work of an organization can interact with the experts or technicians who are accountable for the services and their related topics through this IT Complaint Service Desk. Service Catalog comprises of name of the service, ownership of the service, data informing that helps the service providers to set expectations for their service sequesters. Reduces the costs and hence services that are less beneficial can be replaced considering the impact they have on the organization. Basic and formal goal of incident management is to check the service that are down or are creating or having issues and get them up and running within no time, thus ensuring best services and maintaining the level of quality provided by the services and their availability. Services that are taking longer time to be solved are assigned to the knowledgeable technicians so that the productivity increases and the services are restored quickly. Incident management includes detecting and recording the incidents, classifying, investigating and analyzing them and then providing a appropriate solution or a recoverable answers. Once the incidents are solved they are recorded so that re-occurrence of these incidents can be avoided. This Online IT Service Desk Software deals with customer –level. Calculates and reduces the impact incidents have on organization. Prioritizes the incidents based on the level of urgency and the effect that the incident has. Increases the quality of service provided. Automatically closes all the solved issues. A problem is the root cause of incidents and the process of resolving these problems which are caused by end-users errors and reaching a desirable and adaptable solution is done by problem management. Problem management is either reactive meaning solving the problem when an error occurs or proactive meaning recognizing the problem and calculating the risk factor before they create any trouble. The main purpose of problem management is to provide the users with straightforward, acceptable and easily understandable solutions which are easy going and have less impact on the overall organization. Problems are detected, analyzed, and a workable solution is reached. The main purpose of change management of the IT Compliant Service Desk is to represent the life cycle of all changes. As new innovations evolve in the world of IT, care should be taken that while executing these changes they have the negligible impact on the organization and are easily acknowledged by the users. Changes should be implemented in such a way that they cause least of disruption to the IT services. Change management accepts the changes, prioritizes them, calculated the impact changes will have on the service, schedules as to when the changes should take place and how they should take place, implements the changes, reviews them with the users about the effect they had and then finally gives information about change management qualities. Prepares the organization to withstand change.  ITIL, an Online Service Desk Software was originated in the 1980’s. It makes sure that it services and organizations needs work in hand in hand. It can be applied by any organization which in turn leads to increase in growth and reduce in risk. By utilizing ITIL Service Desk Tool the organization can work in an organized manner and it can stay upgraded which leads. Scrutinizes IT services which leads to improvement in performance. Assets are managed properly hence they can be utilized properly during their life cycle and are available when needed. Why To Choose RegitWise Service Desk ? There are two ways in which tickets can be generated in RegitWise Service Desk, an Online Service Desk Software: automatic ticket dispatch and manual ticket generation. When the tickets are generated automatically through this IT Service Desk, emails are sent to the specified user automatically. Ticket generation reduces the work of task manager. Generating of reports and conducting surveys are the features included in self-service portal of this IT Compliant Service Desk. User can customize their reports according to their needs. 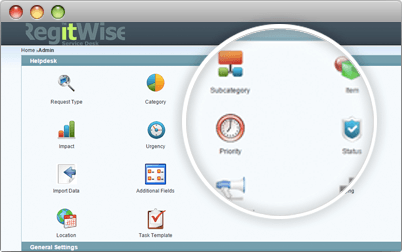 Surveys can be conducted by the users where they can get feedback from the users about the services and products of RegitWise Online Service Desk Software. 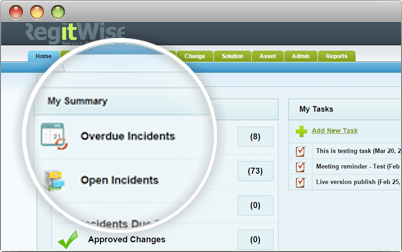 RegitWise Online Service Desk Software provides key features like identifying the task, managing and scheduling the task & incident list. With the help of Manager Dashboard the user does not have to go looking for the task he has to perform on the current date. It reduces the work of Technicians and makes admin work easy and simple using IT Service Desk Tools. Terms and conditions between service provider and service users are known as SLA. These are a set of predefined rules that the technicians have to follow. Technicians have to complete their task before any of the SLA’s are breached. ITIL aligns the IT services Desk Tools with business needs. Incident, problem, change and solution management modules are all a part of ITIL package. Managing the incidents, providing appropriate solutions, managing knowledge base, handling the changes are all done with the help of IT Service Desk packages. Asset management manages both hardware and software assets of the company and keep the company’s inventory record up to date. A list of all the assets of the company and their hardware specifications is visible to the user in asset management module. Managing, maintaining and tracking of the projects is easily done with the help of RegitWise Service Desk – an Online Service Desk Software. Customers will have complete control of project ticket queues, customized reporting, handling and scheduling task, self-service, users and technicians portal. Detailed information about the tickets assigned to the technicians such as number of tickets open or closed or overdue, status of the tickets, survey statistics can all be known with the help of Manager Dashboard. Service desk lets the user archive the old and used data. This in turn improves the RIW Service Desk performance. This archived data can be used while generating reports. The total sales of the company’s product for a particular interval of time can be known with the help of Sales graph. It helps the user in determining daily, monthly, weekly and yearly sales of the product. 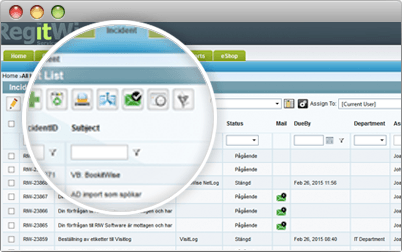 Mails are fetched from the inbox of the technicians and tickets are created automatically with the help of auto incident feature of RegitWise service desk. Manage your service desk from anywhere with the help of Service Desk Mobile View which is now available on all major mobile browsers . Various reports types such as chart, matrixes and tables can be generated with the help of reporting module. Reports can be generated for incident, problem and change management module.